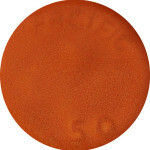 During their production run, Pacific Pottery used a variety of in-mold marks and backstamps to identify their pieces. 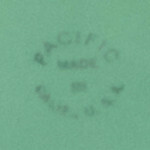 Most Pacific Pottery pieces are marked, not only with the Pacific name, but also the piece number, making it easier to identify and categorize. Collectors will find two primary in-mold mark styles, the earlier handwritten “Pacific” with the number below, or the in-mold ring with “Pacific…Made in USA” with the piece number in the center. 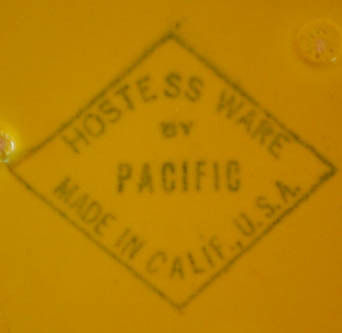 In the very last year or so of manufacture, you will sometimes see a diamond-shaped backstamp marked “Hostess Ware.” This mark is much harder to find since Hostessware production slowed down in the late 1930s as Pacific focused on other lines such as Arcadia, Coralitos, and artware. 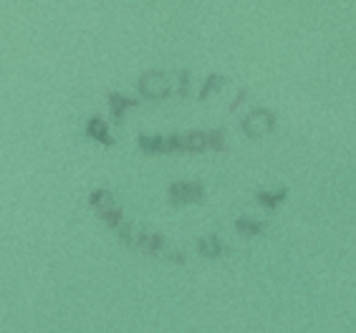 It is also not unusual to find the foil sticker logo shown above on pieces. The sticker was used in the early days of production.